I could be wrong, but I'm thinking Apple has got to do a 32gb iPhone. There is already a 16gb version as of February. There's a 32gb iPod touch. I'm thinking they wanted to reposition the iPhone as cheaper and they'll probably charge $399 for the 32gb version. Releasing that now spoils their cheaper message. That's all the evidence I have but it may stop me from buying a 16gb iPhone in July. Update on July 8. Well, July 11 is coming soon and I still don't have any good evidence for a 32gb iPhone in September... that's going to make it tough to resist buying a 16gb iPhone Friday. Update on July 10. No word on another iPhone 32gb. However, lots of people believe there will be one and that it is likely to be released in September when new iPods are announced. The other possible release date for such a phone is at the MacWorld Expo in January. A long, long time from now. There have been rumors all along of a higher-end iPhone. All the early adopters will want one if they can afford it including me. Will it have a better camera? The lack of an upgrade to the camera in the 3G iPhone is one of the reasons I think there is a higher end version of the iPhone in the works. One last thought. Apple got in big trouble when they dropped the price of the iPhone from $599 to $399 in September. They would get into big trouble if they release a better iPhone in September. But if we can just bring our iPhone 3G in and trade for a small restocking fee it would be OK. The bloom is off the rose of iPhone 1 by now. You must be able to drill down to get more details before being cast off to the big web for more info. When I look at the weather, I need a lot more than the current temperature. How about an hour by hour forecast for the next few hours plus options for tomorrow? I know, the current weather widget is almost glanceable but you have to tap first, by then you might as well see a little more info. Yahoo! 's stock widget cries out for an ability to drill down. If my stock drops precipitously, I'll stop and look more carefully. I may well need to make a decision involving thousands of dollars. Earn your keep, iPhone! The iPhone is a computer in my pocket with a high Rez touch screen. It is my always on, always with me real-time connection to the world. Don't limit it. While you are at it, let me email screenshots of these widgets. My friends and stock broker are standing by. Tags: iPhone, iPhone 2.0, iPod touch, stock widget, weather widget, Yahoo! Check the Apple site for details. Here are highlights for the keynote. 1. iPhone 3G Introduced. GPS. "Location-based services are going to explode" says Steve. $199 for the 8 gb in black. $299 for 16 gb black or white. Improved audio. 1/2 the price. Same 2 megapixel camera. 2. iPhone 2.0 is $9.95 for the iPod touch. 3.5" display. 3. 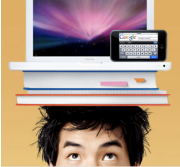 MobileMe replaces .Mac with 20 gigs of Storage $99/year. "Exchange for the rest of us." It works over the air to your iPhone and Macs and PCs. It's at www.me.com. Cool!!! Shows your iCal calendar exactly like it looks on your Mac. Photos will live update wirelessly to your gallery.me.com page. Mail looks like Mail except it is online. iPhone has a new Send to MobileMe button for your photos. 4. Full Microsoft and iWork support. 5. Push Notification Service to capture stuff while your app may not be active cuz you are using another app. This is to compensate for apps running one at a time. Available September. 6. Band - see pictured above : very cool Moo Cow Music thing called. 7. Native TypePad blogging application. 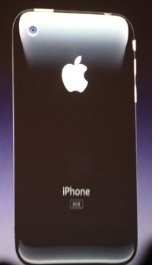 This may be the first true iPhone 3G reveal. These pix come from CrunchGear. See several photos there. 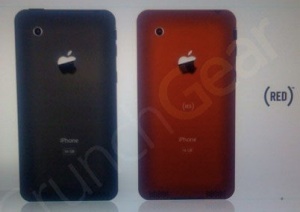 Bottom lines: (1) Colors: Black and Red, (2) 3G, (3) 2nd video camera, (4) Thinner! and (5) stereo speakers on back. 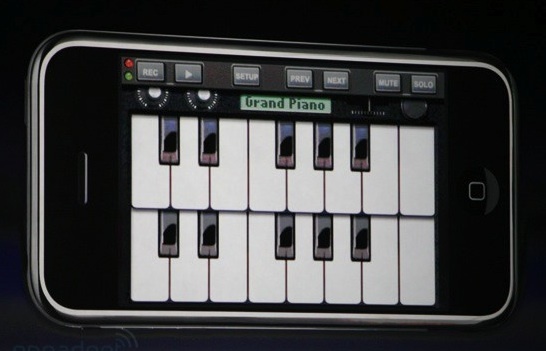 Update 11:43 pm: Engadget says they think this is a fake. 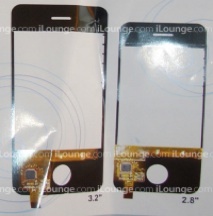 According to iLounge, these may be the screens for the 2 new iPhones due for release next week. The larger one is a 3.2 inch screen - a bit smaller than the current iPhone's 3.5 inch screen. The smaller one is a 2.8 inch screen. This all looks credible to me. We don't know, but higher screen resolutions for the same price are the norm from one year to the next. Apple likes to make each version of the iPod smaller, why not the iPhone? If the new BlackBerry Bold can be 320 x 480 in a much smaller space (sideways), each of the two screens shown here could be at the 480 x 320 resolution. I'm guessing we would survive with slightly smaller type as long as applications get a bit better about increasing the size of the type when you rotate the screen from vertical to horizontal. These could just be prototypes or trials or fakes. But what if they are the new iPhones? There are a few reasons to believe that the iPhones will not be available until the end of the month, but there are more reasons like stock shortages pointing to availability as early as next week. Which would you prefer? Some of us want a smaller size. Some us will be more moved by the capabilities of the iPhone than the small size. As a power-user, it will be hard to resist the larger iPhone if it is the only one to have 3G or GPS. I'll probably opt for the bigger size. I'm expecting the two devices to be Jr. and Sr., to be sort of a nano version at $249 or $299 and a full-size, full-featured version at about the current $399 price point. If, however, the rumor about AT&T subsidizing their store's iPhones and Apple selling them unlocked, we may see the Apple stores selling the larger iPhone unlocked for $499. Since iPhones are not flying off the shelves just now and RIM isn't seeming to be losing share yet to iPhone, Apple will want to be aggressive with their pricing. Stay tuned, more information is likely to leak between now and Steve's keynote address on June 9th.